The Appalachian Trail is one of the oldest and most important hiking routes in the United States. It’s the route that settlers followed as they streamed west from the original 13 colonies, and provides the only walking route into my home state of Kentucky. Daniel Boone walked the Appalachian Trail, and every year hundreds of hikers do the same. 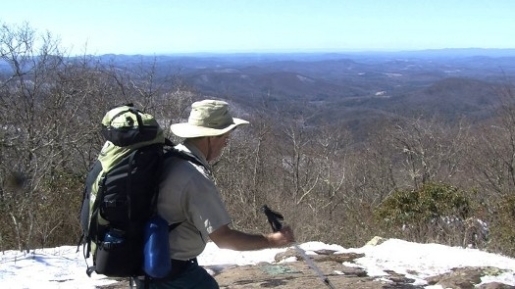 What separates Mike Hanson from the masses is the fact that he is blind, yet this blind man will hike the 2174-mile Appalachian Trail with no guide dog and no help besides a GPS unit and his cell phone. Mike’s got a website, Blind Hiker, and a blog, though neither have been updated for awhile. Apparently, it’s harder than you’d think to get online in the middle of nowhere. However, he’s halfway through his journey, and he’s making better time than he expected. You can follow Mike’s journey easiest via Facebook. Just because you’re blind, that doesn’t mean you can’t get around on your own, but I know experienced hikers with eyesight who have yet to conquer the App Trail. This guy is pretty brave; if nothing else, he’s a great example for anyone who has ever had a dream and then gone out and clobbered that dream right in the face with a stick.